Here's where to watch every episode of The Bill season 4. Mouseover or tap an episode to see where to stream it. Click or tap the play icon to stream it on the best available service. Light Duties Jul 19, 1988 Recently promoted to CID, D.C. Carver is feeling seasick while he and D.S. Roach work on a case on the police launch. The River Police fish the body of a murdered informant out of the Thames, but Roach is furious when the case is taken over by two detectives from Scotland Yard. P.C. Taffy Edwards and Stamp attend an incident with an unconcious elderly man who has a very protective dog. A woman offers to help, but Stamp tells her to move along. Stamp is horrified when the woman arrives at Sun Hill as the new uniformed Inspector, Christine Frazer. P.C. Hollis is running a sweep on who D.I. Galloway's replacement will be - there are rumours it will be D.I. Burnside. At the hospital, a solid gold krugerand is found on the old man, and W.P.C. Ackland and D.C. Carver realise the body in the river is the old man's nephew, who was grassing on his accomplices in a krugerand robbery. Sgt. Penny is back at work on light duties, but he is clearly still deeply affected by his recent shooting. The Three Wise Monkeys Jul 21, 1988 D.S. Ted Roach and D.C. Mike Dashwood are on the trail of armed robbers who have taken a women hostage. Sgt. Penny is starting to stress out because of the guns involved, and his collegues are concerned about his reaction. Two D.C.s from Somerset arrive to take a prisoner back. P.C. Yorkie Smith and W.P.C. June Ackland chase the robbers with three members of T.S.G. in the back. After being shot at by the robber and nearly shot by one of the T.S.G. officers, Yorkie punches the officer on the nose. Home Sweet Home Jul 28, 1988 Sgt. Cryer leads a raid to enforce an eviction order on a squat occupied by upper-class kids, watched by Councillor Thomas who is in charge of housing in the area. The raid is successful, but Thomas makes himself scarce as soon as a journalist arrives. P.C. Smith and P.C. Haynes are called to the local library where a homeless woman, Marie Tucker, and her kids are sheltering. Haynes moves her along by giving her a council housing brochure, but when they are called to a break-in at Councillor Thomas' home, they realise Marie has locked herself in the bathroom. Insp. Frazer arrives with a social worker who had reported Marie missing and they try to talk her out. When she goes quiet, they break down the door only to find Marie has taken an overdose and died. All In Good Faith Aug 2, 1988 W.P.C. Viv Martella and W.P.C. June Ackland report entry by artifice involving a bogus gasman to Acting D.I. Ted Roach. As Ackland and D.C. Mike Dashwood investigate the two latest cases, the widow of a gas inspector locks the bogus gasman in her basement. Insp. Christine Frazer has a serious talk to P.C. Pete Ramsey. There is a weapons amnesty bin outside the station, and when CID discovers a gun that was used in a robbery five years ago, Roach is determined to nail the suspect, Pat Duffy. Ch. Insp. Conway seeks legal advice as to whether the gun can be used as evidence as it was handed in during an amnesty. Roach disobeys Conway's orders and arrests Duffy. Conway is furious, but Roach tells him that they're in the clear as Duffy's ex-wife handed the gun in. Just Call Me Guvnor Aug 4, 1988 Ch. Insp. Conway briefs the relief on a massive raid about to take place on Frontline, a gang of football thugs. Two police officers are undercover in the gang, and the relief are warned not to show them any signs of recognition, however Acting D.I. Roach and D.C. Carver are stunned when they see D.I. Frank Burnside in handcuffs, blowing his cover. Roach headbutts a suspect who spat at him. The suspect gives his name in custody as ""Get Stuffed"", and Burnside, who has arrived to take over Sun Hill CID, gives him a slap for his insolence. With no love lost between Sgt. Cryer and Burnside, Cryer threatens to report Burnside if he raises Roach's assault of the same prisoner, but Burnside shocks them all when he reveals that the unfortunate prisoner is the other undercover officer in the gang. Burnside catches up with his old flame, Insp. Frazer who later has a word with Cryer for spreading rumours that Burnside is corrupt. A chastised Cryer swallows his pride and apologises. Homes And Gardens Aug 11, 1988 P.C. Yorkie Smith assists P.C. Taffy Edwards dealing with a traffic snarl-up caused by a young man, Mickey Cozens. Mickey's father is called to the station, and he tells the officers that Mickey has a mental age of 7. Smith drives them home, but when Mickey's dad tells his son off, Mickey lashes out and knocks Smith unconscious. His desperate father bundle's Smith into the panda car and drives away. A witness reports that a police officer has been kidnapped, and massive chase takes place until the car is stopped and Yorkie found alive but concussed. A couple come home from holiday to find their entire garden has been removed - trees, lawn and greenhouse. Turns out to be poetic justice as the husband is rumoured to have nicked the plants from the council in the first place. Country Cousin Aug 16, 1988 D.I. Burnside waits impatiently at the train station to pick up a D.S. Jarvis from one of the country forces, who is arriving in London to arrest a suspect believed to be living in Sun Hill. After warning Jarvis for punching the suspect in the face, Burnside takes Jarvis to an East End club where the badly-behaved country copper ends up fighting with the manager and bouncer over the cost of a prostitute. P.C. Edwards and P.C. Haynes attend a bus crash where the driver and several passengers are badly injured. Accompanying the driver to hospital, it is discovered he was suffering from epilepsy which he had not declared to his employers. W.P.C. Martella drives Sgt. Penny to a doctor's check-up to ascertain whether he can return to normal duties after his shooting. Alarms And Embarrassments Aug 18, 1988 Yorkie investigates a robbery of an off-licence. Penny is thinking of his holiday. Roach has a case thrown out of court. Stamp is in charge of organising a line up. Taffy investigates a mugging of a handicapped man. A bag lady brought in by Frazer sets fire to her cell. Stealing Cars And Nursery Rhymes Aug 23, 1988 Yorkie has problems with kids at a youth group. He chases a group of kids in a stolen car that ends up with 2 deaths after wrapping around a pole. Ramsey seems to have collected a stray dog which runs loose around the station. Haynes slags off the kids of Sunhill in front of Yorkie. Ramsey investigates a ufo which turns out to be a satellite dish. Hold Fire Aug 25, 1988 P.C. Smith and P.C. Melvin are first on the scene of a traffic accident. The cars are on fire, and both officers risk their lives to rescue the occupants. One of the cars explodes, killing a passenger, knocking Smith unconscious and burning Melvin's hands. One of the men they rescued is a big-time villain, and the F.I.O. (Fire Investigations Officer) reckons he had explosives in the boot. D.C. Carver and W.P.C. Martella stake out a pub, but get distracted playing video games. They eventually follow and arrest a man who is ripping off his employer. D.S. Roach attends the Met's firearms training for renewal of his firearms authorisation. He fails spectacularly and his licence is revoked, but it's clear he failed deliberately. At the hospital, Martella arrives to help Melvin keep an eye on their suspect, but they are distracted when a man high on drugs runs through the ward, and their villain disappears. Bad Faith Aug 30, 1988 TSG, Haynes, Ramsey, Mike and Jim are staking out a tower block to bring in a burglary suspect. Bob and Taffy find some children on some waste ground. Mike's car get hit by a falling telly. Requiem Sep 1, 1988 P.C. Ramsey and P.C. Haynes attend a flat where the occupants have discovered a decayed skeleton in the wall where they were going to build a fireplace. Sgt. Cryer, D.S. Roach and D.C. Dashwood are called in, and a forensic expert soon arrives to examine the body. What looks like a baby's body is also found, but it turns out to be a doll. While CID search for former occupants and interview the Trants' obnoxious neighbours, a note is found in the wall from a merchant sailor who couldn't afford a funeral, so he put his dead wife's body in the wall. Trespasses Sep 6, 1988 P.C. Ramsey investigates noises in a rubbish chute, and finds a newborn baby which he rushes to hospital. In the CAD room, P.C. Haynes and W.P.C. Brind argue over why anyone would dump a baby. P.C. Edwards and P.C. Melvin follow up on the theft of items from a church, and Edwards is surprised when Melvin tells him he's a born-again Christian. D.C. Dashwood discovers the church property in an antique shop, and Sgt. Peters and D.C. arrests the culprits in another church. Edwards and Melvin catch a woman removing her property from her ex-husband's house. Save The Last Dance For Me Sep 8, 1988 A dangerous escaped prisoner is supposed to visit his girlfriend in Sun Hill, and a massive obbo is in place to catch him when he turns up. A bored relief waits in the canteen with P.T.17, and P.C. Ramsey suggests a little game of cards to pass the time. Sgt. Peters and D.C. Carver wait in a van, and while Peters is answering a ""call of nature"", Carver nicks a boy for damaging cars. D.C. Dashwood and W.P.C. Ackland wait in a dance school, where they each take a turn in partnering a dance student. The jealous husband of Dashwood's dance partner storms in and attacks them, taking Mike's gun, which fortunately is unloaded. Ch. Insp. Conway nearly blows the obbo when his impatience causes him to break radio silence, despite D.S. Roach's warnings, but his radio call is just the diversion Dashwood needs to overpower his assailant. Runaround Sep 13, 1988 Viv has hay fever and tries to get medication but is called to a cafÃ© with a dead body and is man-handled by the deceased's son. Yorkie visits a lady with agrophobia who thinks her neighbour is being burgled. He gets on their truck and helps June and Haynes arrest them. Haynes and Ackland run into a drunken driver in a bus garage using a sledge hammer to break windows. The Trap Sep 15, 1988 D.I. Burnside sets up a trap on a residential street: an open vanload of video recorders. He, Carver, Roach and Dashwood sit in wait for some villains to take the bait. Eventually, a man pulls up in a BMW and takes one of the videos into his house. Roach and Dashwood arrest him, and back at the station he turns out to be Julian Pembridge, a slimy solicitor well known to Burnside. Pembridge claims he was merely exposing a police entrapment campaign, and manages to escape with a fine. With Sgt. Peters on leave, Sgt. Cryer and Insp. Frazer are concerned about Sgt. Penny's state of mind. Ch. Insp. Conway has a word with him and asks him to take some leave. Penny insists he's fine and refuses, but when the air conditioning breaks down in the CAD room, Penny's temper rises with the temperature. He spills a coffee on his keyboard, and tries to attack the electrician - taking leave is no longer optional. Community Relations Sep 20, 1988 P.C. Melvin and P.C. Ramsey are in a garden shed doing an obbo on a garage believed to contain with stolen motorbikes. Ramsey is winding Melvin up about being a Christian, when a ball is kicked through the window. The owner of the shed gets into a violent row with his family, and while Melvin and Ramsey are dealing with the domestic at the house, they miss the suspect arriving at the garage. Ch. Insp. Conway attends a meeting at the Town Hall with residents of the Jasmine Allen Estate, but the meeting degenerates into arguments and slanging matches. P.C. Smith brings in a violent prisoner from the estate who was high on cocaine, but Sun Hill faces a death in custody when the man dies of an overdose shortly after arrival. With a riot brewing outside, Insp. Frazer must convince the man's father to tell the mob to blame the drugs, not the police. A Dogs Life Sep 22, 1988 Taffy is trying to find someone to form a syndicate to buy ½ share in a greyhound which turns out to be stolen. Reg is keen on joining Taffy in syndicate. He is also very knowledgable about the dogs. Flytipping increases. Ramsey is asked to talk to his brickie mate. Mate says there is a war on with flytippers. New person is tipping all over the place and council can't accept quiet backhanders any more. Haynes and Ackland investigates vandalism at a renovation. Asks claimant about flytipping. Mother of one of the suspects comes with him to the station. Asbestos is involved in latest tipping. Other boy involved in vandalism has been beaten. Running Late Sep 29, 1988 W.P.C. Brind is late for parade, and misses a warning to the uniform relief to stay away from the Dock Industrial Estate, where C.I.D. and a P.T.17 team are awaiting a security van robbery. While on foot patrol, Brind chases a young girl onto the estate and into the middle of the operation. Burnside stops a suspiscious van, but it turns out to be full of fish. Brind is yelled at by Burnside and Sgt. Cryer, but she has her suspiscions about the girl, Jane, and her family. Meanwhile, Burnside realises the security van visits the estate twice, and he races back with all the armed officers he can muster, just in time to catch the robbers. Brind returns to Jane's flat where she discovers a bedroom full of nicked goods. She arrests Jane's mother, who turns out to be one of Burnside's snouts. They Say We're Rough Oct 4, 1988 Viv and Ken go to an army surplus store that seems to be being supplied off the back of a lorry. Van used to deliver the gear was nicked from Yorkshire. 2 redcaps (who don't think much of police) turn up to collect squaddies. Cryer doesn't think they are kosher. Cryer wants someone for a p.a. job at local school and asks Ken to buy a flying jacket. An ice-cream van and a car cause a traffic snarl-up near the station. Roach sends a traffic warden to sort it out. Hollis is also sent out to deal with it. After walking around the block, Hollis comes back to find part of a funeral has now joined the bigger traffic jam. Blue For A Boy Oct 6, 1988 W.P.C. Martella and P.C. Edwards are on the beat, and intervene when they find a man arguing with a young mother. D.C. Dashwood goes to meet a snout, and is nearly run over by the man Martella and Edwards questioned before. The woman, Brenda Knight says he has abducted her baby, but claims she doesn't know him. Burnside is suspiscious, and puts the pressure on Brenda until she admits that the man who took the baby is Sam Rice, who paid her £2000 to bear his surrogate child, which she then refused to hand over. After questioning Rice's wife, W.P.C. Ackland finds him at the hospital with the baby who is in good health. Chasing The Dragon Oct 11, 1988 D.S. Roach spots a drug deal taking place on the Rochester Estate, but he, Carver and Dashwood fail to catch the dealers. P.C. Haynes and P.C. Ramsey spot the escaping car in their panda and give chase, but the dealers' car hits a little girl before crashing into a skip. Haynes loses one of the suspects when obstructed by some punks, but the driver of the car, Mickey Squire, is arrested. With Burnside on leave, Ch. Insp. Conway allows Ramsey and Haynes to continue with the case. Ramsey is pleased as he thinks it may get him back into C.I.D. He and Haynes play good-cop/bad-cop to get a confession, and Haynes goes undercover at a party to find the escaped passenger and the main drug supplier. C.I.D. raid the supplier's luxurious apartment and discover a huge amount of drugs and stolen goods in his garage. P.C. Melvin and W.P.C. Brind attend a fracas at a laundrette. Melvin slips on some soap, leaving Brind to take charge. The Coop Oct 13, 1988 P.C. Edwards and W.P.C. Ackland are on their lunch break, and they warn a man for flying a model helicopter too close to the road. They then investigate a terrible smell coming from a nearby property, and discover a shed full of the carcasses of battery hens. The smell is making Edwards sick, and he wants to get out and report it to the RSPCA. As he and Ackland are leaving, they are taken hostage by the deranged shed-owner armed with a shotgun. Sgt. Peters goes to look for them after dealing with the model helicopter crashing into a house. Peters, along with P.C. Stamp and P.C. Melvin dive for cover as the man starts firing his gun, but he is overpowered and arrested. The Quick And The Dead Oct 18, 1988 Sgt. Peters attends a physical fitness evaluation, but does not do too well. P.C. Ramsey and P.C. Frank gives chase when they witness a robbery. The robbers escape, but they manage to nick the driver, who insists his car was hijacked. Ramsey interrogates the boy, but Ch. Insp. Conway intevenes when Ramsey's heavy-handed approach becomes apparent. Conway releases the boy when he admits he was on his way to a job interview - as a male stripper. W.P.C. Ackland investigates the theft of a cat's gravestone, and finds it in the elderly cat-owner's rest home. A corpse goes missing when an undertaker's van is stolen by yobs, but P.C. Melvin tracks it down. Ramsey is giving everyone else a hard time about their fitness tests as he think's he's the fittest guy at the station, but when it comes to his test, he cannot sit it due to high blood pressure. Witness Oct 20, 1988 P.C. Ramsey and P.C. Smith are looking after a witness in a court case. Ramsey is amused that the witness, Andrew Pike, has a high opinion of the police and is applying to become a special constable. Ramsey gets bored at the flat, and convinces Pike to have a day out at the dog races. At the track, Ramsey throws a drunk out of the toilets, and Pike takes offence to his handling of the situation and threatens to report him. Smith goes to get a cuppa and Ramsey is watching the race. Pike disappears, and they manage to rescue him just in time. P.C. Edwards is in court, testifying in the case of an assault on a woman. His notes end up in the toilet and the case is dismissed as not proven. Here We Go Loopy Lou Oct 25, 1988 Bob. Claire and Taffy investigate the report of a man carrying a cross which is found hanging from a crane. They come across a lady driving a car with a small white dog on her knee which is knocked down by a truck after escaping from the car. Taffy swims across a canal after a religious nutter who tries to strangle Bob while thinking he is Christ. Stop And Search Oct 27, 1988 Sgt. Cryer introduces two special constables who will be joining the relief: Mary Kilnair and Brian Defoe. While on patrol with P.C. Edwards, Kilnair is pricked by a junkie's needle, there is grave concern she may have been infected. A man arrives at the station to confess to the murder of his wife - thirty years previously. D.C. Carver, and new D.C. Tosh Lines, investigate. 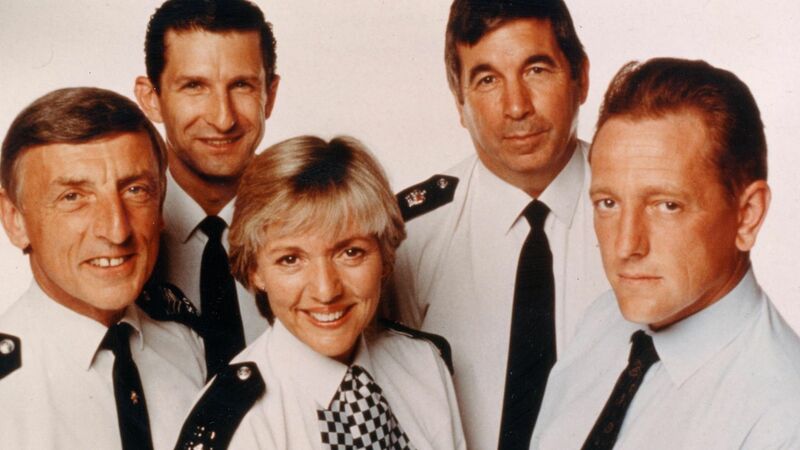 A lawyer meets with the station top brass (Brownlow, Conway and Frazer) to discuss her client's claim of being stopped and searched thirteen times in two weeks. Lines recognises the M.O. from his last nick - several black men giving the same name and address whenever they are stopped by police. D.S. Roach asks Insp. Frazer out on a date, but Burnside finds out and makes fun of him. Spook Stuff Nov 1, 1988 W.P.C. Martella and P.C. Stamp take an American woman who has been caught shoplifting into custody. She is very insistent that the police contact her husband who is staying in a hotel. The husband, meanwhile, is reporting the theft of his briefcase from their hotel room. D.I. Burnside is warned off the case by a Special Branch officer and a C.I.A. agent, who are waiting for the man to sell top-secret papers. D.S. Roach is having money troubles, but when one of his snouts offers to sell him the secret documents, Roach and Burnside use the situation to clear up Roach's debt problem. Roach is furious when Burnside double-crosses his snout and the papers are returned to the Americans. Evacuation Nov 2, 1988 It's a busy day on the station front desk, and P.C. Smith fails to notice that someone has left a hold-all next to the desk. When it is discovered, Insp. Frazer orders the station evacuated as a safety measure while the bomb squad is called in. Sgt. Cryer and W.P.C. Martella have trouble getting a violent female prisoner into and out of her cell. D.C. Dashwood winds Smith up about not noticing the bag, and he conducts an interview with a suspect in a car. P.C. Edwards is acting oddly, arguing with W.P.C. Ackland and he keeps returning to the station looking for something. SO13 find an incendiary device in the bag, but it explodes, blinding an SO13 officer. Personal Imports Nov 8, 1988 P.C. Melvin sees a chemist being robbed, but he has powder thrown in his face and the thieves escape. D.C. Carver is conducting an obbo in the house of a lonely, amourous woman. He spots what looks like a drug exchange and pursues the car, but is told to relinquish the pursuit to the drugs squad from the Yard. W.P.C. Martella investigates a truancy case, where 14-year-old Turkish boy Omir is being looked after by his cousin ""Auntie"". D.S. Roach is pushed over in a public toilet by a man picked up by another bloke. He gets a tip-off from his transvestite snout, Roxanne, about a local barmaid running rent-boys in the area. Martella recognises the address as that of her missing Turkish boy, and she and Roach raid the flat and arrest Auntie. Paper Chase Nov 10, 1988 A schoolgirl has been abducted, and D.I. Burnside is determined to find her. The girl's father is reluctant to have the police involved, as the kidnappers have threatened to kill his daughter if the police are called. He gets £250,000 out of his company account to pay the ransom. A technical officer from the Yard is called in to bug the briefcase. C.I.D. wait and watch with binoculars, and after a decoy run, the father makes the drop. Immediately Burnside and his team raid the premises, but there is no one there and the briefcase is empty. The little girl turns up at home safe. Burnside smells a rat, and the technical officer finds the bugged briefcase and money in the father's car. Intruder Nov 15, 1988 While Melvin and Haynes are on the beat, they are nearly decoyed away from a robbery. Giving chase Haynes is diverted to an armed robbery while Melvin has to let his prisoner go so he can help Haynes. The armed robber is paranoid and thinks everyone is poisoning him. Conflict Nov 17, 1988 Lines and Carver are doing an obbo on a man who might lead them to an arms dump. June and Ramsey arrest him because he beat his girlfriend who didn't want him to go out. The doctor at the hospital is going to make a complaint against Ramsey because of the way he interogates the girlfriend. Duplicates Nov 22, 1988 Due to her slight resemblance to a missing woman, W.P.C. Brind reluctantly agrees to perform a reconstruction of her disappearance for television. D.S. Roach and D.C. Carver go to serve an arrest warrant for video piracy, but instead find the aftermath of a bare-knuckle boxing match and a critically injured fighter. The organiser tries to bribe Roach. Carver and Roach manage to locate their video pirate, but Dashwood shows up late to the raid as he is speaking to camera for the reconstruction. The missing girl's parents thank Brind for her help. Old Habits Nov 29, 1988 W.P.C. Brind is called to the house of an elderly lady, Mrs Lomax, who has just been robbed. The old lady is in such a state of shock, she attacks Brind and then suffers a heart attack and dies. It appears there's been a spate of burglaries against several old people from the Salisbury Day Centre, and Brind attends with Insp. Frazer to give a talk on crime prevention. D.C. Dashwood talks to the previous victims and comes up with a possible suspect: Terry Newton, a young lad doing community service at the centre. Terry's probation officer is obstructive to the investigation, and Dashwood is convinced they have their man. Terry admits to Brind that he thinks he knows who it was: Danny Harvey, the junkie newphew of one of the day centre members. D.S. Roach and Dashwood go to Maurice Harvey's flat - he's an old villain from the time of the Krays - and find that Danny has overdosed in the next room, but his uncle doesn't care. The Silent Gun Dec 1, 1988 P.C. Haynes arrives at a house to investigate what seems like a routine disturbance. Instead he finds a bailiff who has been shot in the hand while trying to evict the lodger in the upstairs room. Ch. Supt. Brownlow cancels his weekend away and takes charge of the siege, Ch. Insp. Conway and several armed police from Sun Hill and the TSG move in to try and negotiate the gunman's surrender with no response. A Polish interpreter is brought in when it is realised that the man is Polish, not Irish as reported by the landlady. There is still no response, and a local shopkeeper tells P.C. Smith that the man, Lublin, is also deaf. With no chance of him hearing them approach, armed police and a police dog storm the room and arrest the man. The local residents are getting antsy about being denied access to their homes. P.C. Edwards is sent to turn a woman's oven off, but he breaks into the wrong house. An Old-Fashioned Term Dec 6, 1988 P.C. Edwards and W.P.C. Morgan find the naked body of a young woman who appears to have gassed herself to death, but they notice the neighbour who reported the death wiping something from the dead girl's mouth. D.C. Carver can't believe D.C. Lines has been a D.C. for twelve years. Lines isn't convinced the girl's death was a suicide, and impresses Carver with his detective skills when he solves the case - the neighbour, Kelly, has knocked her out with chloroform, raped her, and then turned on the gas. Kelly finally admits it, but Tosh is upset when he won't admit why. D.C. Dashwood is furious when D.S. Roach stands him up on an obbo to have dinner with Insp. Christine Frazer. Getting Stressed Dec 8, 1988 Frazer is driving to work when she sees an accident. On informing the man she has rescued she is a police officer he hits her. Ramsey deals with a lady who was raped. An old lady helps Dashwood with info about motorbike muggers. After June brings in a lady drunk in charge of a baby, she goes to help CID as a decoy. After a chase Dashwood lets them get away. Ted is told to stop the relationship he has with Frazer. Tigers Dec 13, 1988 An asian lad rings Burnside about a big fight. After checking it out, Carver and Tosh's car get turned over. The lad ends up in a canal. An old girlfriend of Carver's turns up looking for him with a baby which she then leaves behind. Guessing Game Dec 15, 1988 Neighbours report an elderly man hasn't been seen for a couple of days, and P.C. Ramsey breaks into the house to find the man dead on the floor. A doctor confirms he died of natural causes. As W.P.C. Ackland checks the house, she is suspiscious of the pictures on the wall and some woman's belongings in a shoe box. It appears the man had a fetish for restraining women against their will, and a CRO check reveals that he had form for such crimes dating back for decades. The belongings found in the house are quite recent, so D.S. Roach suspects that he had captured another victim before he died. Roach, Dashwood and Carver investigate every possibility and finally find another flat owned by him, but no victim. They realise that the neighbour who reported him missing was his intended target, but Roach decides not to tell her about how close she came to danger. The Assassins Dec 20, 1988 Burnside and Tosh are in a cafe waiting to catch a group of people who take apart restaurants. They turn out to be upper class twits. One of them winds the magistrate up so much he is sentenced to 28 days in jail and the diplomat father of another waives his immunity. Yorkie and Haynes investigate a removal van. The elderly driver doesn't think the company is to be trusted and he is proven right after visiting the station three times. Tosh's wife turns up looking for housekeeping money from him, and she mentions it is their 15th wedding anniversary. Outmoded Dec 22, 1988 Sun Hill police are being called out to a series of bogus shouts which the Yard pins down to a computer hacker breaking into the police computer network. Sgt. Cryer investigates, and finds a former university student who has a acquired an ex-MOD computer which still had access codes to government and police networks on the hard drive. W.P.C. Ackland checks in with a woman who is too scared to leave her flat as she has been repeatedly mugged. Ackland convinces her to go out to get some cigarettes, but when they return, her flat has been trashed. June arranges for her to be moved off the estate. Roach, Dashwood and Carver watch as a car is pulled out of the river with the body of a young woman inside. They question the car owner who had reported it stolen, but he is clearly hiding something. D.S. Roach must inform Sgt. Cryer that it was his son, Patrick, who was driving the car when it went into the river, and that he'd left the scene. Digging Up the Past Dec 27, 1988 An excavator on a building site has uncovered some human remains, and Sgt. Cryer calls in C.I.D. Cryer is avoiding returning to the station, as his son Patrick is being charged with causing death by dangerous driving. Ch. Insp. Conway, Burnside and Roach have a word with Cryer, who is avoiding his family. On the building site, D.C. Dashwood and the S.O.C.O. wind up the site manager by saying it may have been a murder, although the bones are very old. A riot ensues as the men want to return to work. Burnside arrives and nicks the whole lot of them. The bones turn out to be from the Great Plague in 1665. P.C. Edwards is angry after being sold forger theatre tickets by Ramsey. Ramsey claims innocence, and the pair manage to locate the forgers. Unable to interest C.I.D. in the case, they investigate on their own and blow a joint Fraud Squad/U.S. Treasury operation to catch counterfeiters printing fake American dollars.